Writing a thesis is like weaving on a loom. The balls of wool and other material available are the data gathered from the literature, the research and thinking about the topic. The finished material is the thesis. The mechanics of weaving the material are like the processes of putting the thesis together. The weaver gathers together the raw materials very carefully so that they will fit in with the required overall appearance of the finished cloth. The materials must blend together to produce the final effect required. Putting in a wrong piece of material, just because it is available, may ruin the whole effect. Every piece must be carefully considered to make sure that it fits. So too the material that goes into the thesis must be considered properly for its proper fit and meaning. Putting in extraneous material where it doesn’t fit will ruin the functioning of the whole thesis. Care must be taken that the parts will fit together properly and complement each other. Each piece of raw material must be fed into the loom at the right time and place. Each piece will have a place where it fits and many, many places where it doesn’t. Deciding which is the right place is one of the demands of constructing the finished material. If the material is to be properly woven and become aesthetically pleasing this must be done for every bit of material and at every step of the weaving. Anything else will produce a mish-mash of conflicting colours and textures that will bewilder and confuse the eye and mind of the beholder. So too care must be taken that the right data is entered into the thesis at the right place and time. Putting the discussion of the theory where the conclusions should go will ruin it completely. The data must fit and flow with the progression of the thesis as a story. Even when all the raw materials have been fed into the finished cloth the job is not finished. 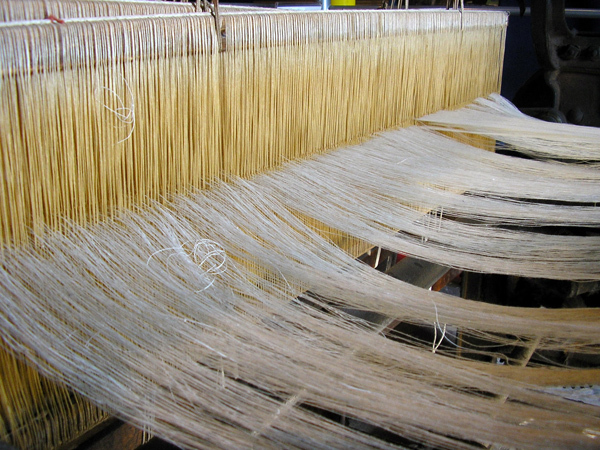 The ends of the warp threads must be tied off, so that the cloth does not fall to pieces when it is taken off the loom. Any loose ends of threads have to be tidied up so that the finished cloth has a smooth appearance. Any loose ends must be either removed or sewn into the rest of the material. The final tidying up is as important as any other stage in weaving the finished cloth because it will affect its appearance and durability. So too, the thesis must be tidied up to produce the final draft. A loose end, if allowed to flutter uncontrolled might break the whole of the thesis. The beginning and end must be tied together properly to produce the proper appearance and continuity in its story. Even when the finished material is taken off the loom the work is not finished. The cloth needs to be cut for its final purpose. Without the cutting the cloth will be but an unfinished product. When the cloth is cut to make whatever is required it will then fulfil its true and final purpose. So too the initial drafts of the thesis will require cutting and pasting and tidying up to produce the final draft that goes to the examiners. They will want to see a thesis that is properly completed. The work only finishes when the final, examiners’ revisions are done and the thesis is properly bound and placed on the library shelf for all to admire and read. Only then can the thesis writer relax and claim that the work is finished. As a reward s/he will then have the hard-earned title of Doctor. So what do you think of this metaphor? Does it help you think about the materials that will go into your thesis and how to weave it? If the metaphor doesn’t work for you, what might be a better one? This entry was posted in Getting things done, On Writing and tagged metaphors, Writing. Bookmark the permalink. I’ve been a long distance runner for nearly 13 years now, and getting through my PhD thesis was all about endurance. The lessons I learned on the trail–about pain, struggle, frustration, perseverance, accomplishment, and fortitude–were all deeply relevant. Perhaps the most vital idea to cross over from cross country to scholarship was the importance of finishing. My thesis wasn’t about winning; there were no laurels or cheering throngs when I received my diploma. But was I happy to be on that mountaintop? You bet I was. Thanks Inger. I like this metaphor. It fits particularly with the weaving metaphor we use here in NZ early childhood education. Its what my supervisors have been saying but this really works for me. Maureen i agree i was reminded of this too. And it reminded me of the process of weaving Korowai. So much work and all you thought and feeling will be in it at the end. After reading this i think it would be a good idea if i would work again on mine to get it done for graduation…. if i will ever get to graduation…. I love this metaphor. Laurel Richardson suggests that writers make up their own metaphors for their writing process from something they’re familiar with. Many texts use building as a metaphor for writing: foundations, walls, services, decoration, finishing. And I’ve used knitting in the past. But I think weaving is even better. I’m glad that everyone likes the metaphor. It is one of a few that I’ve found that work for me. I like your weaving metaphor but it made me think of the wonderful weaving artworks made from ghost nets but Indigenous women in northern Australia. Weaving using different techniques can result in cloth, baskets, artwork etc. From my experience writing a thesis using Indigenous research methods relates to weaving, but the end result has space for the different, unique, or odd components. As with your metaphor, care is taken to fit each piece in its rightful place. I also find the use of network recruitment is more relevant than ‘snowball’ recruitment – especially as I have never seen snow. Snowball recruitment, to me, is very individualistic, whereas network recruitment brings to mind the process of making nets, and the attributes of nets. Nets are far reaching compared to a single snowball. A snowball grows as it travels along – pulling everything into the one entity. A net on the other hand is made up of many small fibres twisted together to make the string, which is the knotted to make a net. I like the storyline of metaphors as I think it inspires imagination. I hate to be the first to disagree… but this metaphor doesn’t work very well for me (I know a little bit about both: I’m a PhD student at RMIT, my wife works at the Australian Tapestry Workshop). The problem I have with the metaphor is that most weaving is either done to some kind of predefined pattern (for cloth weaving), or to a pre-specified design (for tapestry weaving): once you have the materials gathered, as long as you have the correct skill set, it’s just the process of putting it together and keeping track of where you are up to. (Not to discount the artistry and craft involved in weaving, but you get the idea…) This doesn’t really describe a PhD to me very well. I guess another thing is that in weaving, once something is woven in to the cloth, there is no real way to go back and fix it — to move it around, or to reconfigure, to change your mind or your direction… I think the process of doing a PhD is (or at least should be) much more fluid than that. Thanks Reuben, you have also captured the uneasiness I felt with the metaphor. Writing is a craft but the text is a lot more slippery and forgiving than the cloth – you can do a lot to hide even badly written text – or more commonly, text written for a different purpose – through re-framing. However as you note the frame of weaving (nor, I would say, the mechanics) is rarely up for redirection in the same way. I think the weaving metaphor appeals because it speaks to the repressed nature of craft in the constative knowledge customary to the PhD form. It appears to the world as knowledge without a material process, and when we’re writing (as writers like Richardson point out) we are stuck in the middle of that process, and we need the support of thinking about craft. Former weaver… Hippy youth… The fixed things are the warp threads. These anchor what is inevitably a piecing together of various threads to form a pleasing composition. There has to be room for arranging and rearranging with the weft. Multiple possibilities. No right or wrong way. Art rules in the thesis!!! What I like about this metaphor is that text and textile have the same etymological root. I wrote my thesis on medieval intertextuality, so I spent a lot of time looking at how writers wove their ideas and texts together with those of others. Like all metaphors it’s only one way of seeing something, but it throws up some interesting ideas. For my writing and research, this metaphor is partly true. I also saw my work in a mosaic-like way – often I would literally cut paragraphs and sentences out with scissors and reassemble on the floor, or on the wall with blu-tak! I like the metaphor of weaving a lot, although a different one worked better for me: composing. I used to listen a lot of classical music, particularly Beethoven, and I noticed how every piece has a beginning and an end, a development of its own in which every note fits in its exact spot and generates the overall effect of the music I’m listening to. It very much reminded me of writing, and shaped my approach to it. I usually write in a way that avoids anything that is not necessary and does not contribute to the whole, precisely because I always thought every argument needs to be in the right place to contribute to the whole melody. Otherwise I have to take it out, even if it is a brilliant idea. I must admit it helped me a lot, as I am by nature extremely absent-minded and it is very easy for me to go off the deep end. My discipline, law, appears to be particularly unwelcoming to such excursions, so I needed somethign to ground me. I’ve always thought of research and writing as akin to weaving – I haven’t got to the details of the metaphor that others have pointed out, it’s just always been a way I’ve naturally thought about the activity. I appreciate the great response! It really chuffs me. I agree that th metaphor isn’t perfect, but then no metaphor is, there’s always slippage between domains. But if it helps, then use it. The more metaphors you consider the better your understanding of the topic will become. Upewnij się, się bezpośrednie światło słoneczne, ale nie nadmiernie. D w twojej program, ale z słońcu może naprawdę bardzo poważnie Wyniki na starzenie stosuje się i rak skóry. na zewnątrz, umieścić na wielkie balsam ekran słoneczny. Aspiryna codziennie zachowa lekarz wyjazd, a także pomóc Ci zmniejszyć niebezpieczeństwo zdarzenie sercowe na dłużej Styl życia. serca, A ci, którzy mieć chwiejny angina.